Buy Face Hair Steamer Humidifier For Facial Sauna Hot Mist Moisturizing Clear Blackheads Acne Removal Skin Care Face Atomizer Sauna Vaporizer at Narvay.com.Facial Steamer Nano Ionic Hot Steam For Face Personal Sauna SPA.2-in-1 Hair and Facial Steamer Face Steamer Humidifier Hot Mist.Personal Facial & Hair Steamer. -Besides hair and skin care, the steamer can also be used for interior humidifying in a powerful and efficient way. Product Built to North American Electrical Standards, 220V or 110V. -Multifunctional 3-in-1 steamer powerful atomizer generates ultra-fine mist that can be quickly and easily absorbed by hair or skin, which can be used for facial steaming helping facial mask processing and hair steaming. Standard salon hair care hot mist steam effectively promotes hair treatment cream absorption. 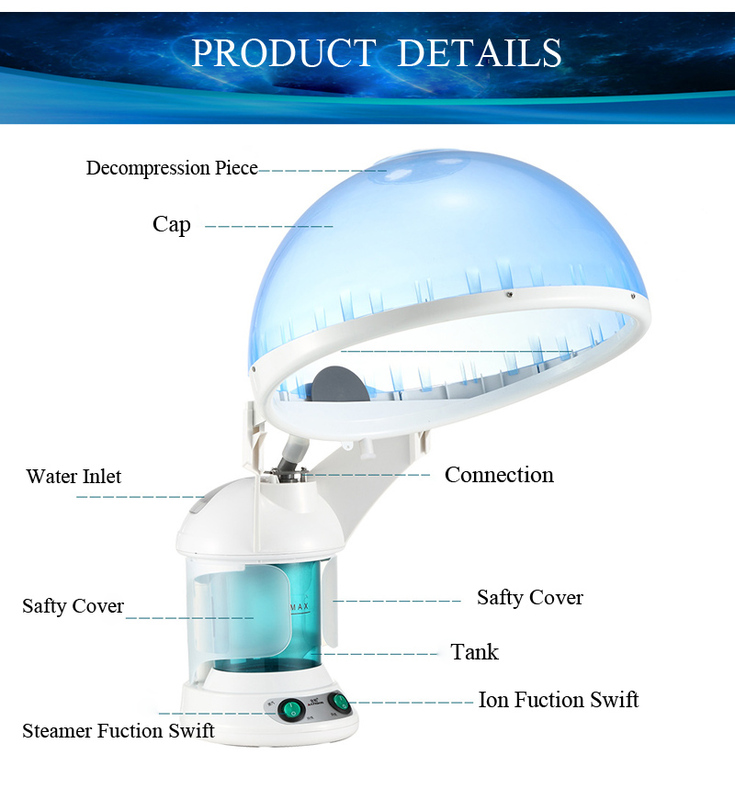 Besides hair and skin care, the large capacity steamer can be used for interior humidifying and has an extra chamber to warm towels for ultimate refreshment in a powerful efficient way. -Moisturize and hydrate your hair, prevents breakage and split ends. Improve absorption of conditioners and other treatments. Hair steaming with hair treatment cream and argan oil hair mask or deep conditioner can deeply hydrate and repair dry and damaged hair.Professional salon treatment that instantly transforms the texture of your hair leaving it soft, silky, and easier to manage. Deeply conditions, detangles, hydrates, and revives dull and dry hair making it shine and elastic. -The ultra-fine mist opens and unclogs facial pores to remove dirt, oil and grime from skin. The daily care nano steamer provides pure nano-ionic steam. Combined a heating element and ultra sonic vaporizer to produce steam with negatively charged ionic particles, the nano steam contain ionic water particles which are up to 10x more effective in penetrating skin. Built-in ozone generator; controlled release of negatively charged oxygen which reduces itchiness and prevents dandruff. -A larger 320ml water tank allows for 45 minutes of working time with a silent operation, long running time. One press button operation, easy and convenient for your beauty routine. High-tech ozone function is provided to sterilize. Smart facial steamer shuts off automatically if no water in water tank, preventing any injury. Designed into desk type, it can free your hands while using the machine, quite convenient to use. The facial spray rod and hair care cap attachment is included. -The warm steam is released after about 5 minutes.For stronger steam spray, press the ion output button. Powerful and ultra-fine steam will be released. Aromatherapy diffusing function is provided. Drop a few drops of essential oil on the cotton pad can get the relaxing facial steaming, great for muscle relief and massage.A full tank of water can be run for about 45 minutes. 10 min face steaming time for once,10-20 minutes steaming for hair-care. Easily remove blackheads and blemishes. Everything is fine, packed super, delivery to the door, the seller is responsive, all questions answered immediately. I am very happy (although i did not try in work, because. The courier left minutes 15 ago). Thank you very much!!! Very fast delivery. The package is great. I tested the only negative point is that the hair at the back of the neck is not well in the helmet. The device is as in the description. Makes curls. So far so good. The item arrived in perfect condition. I did not realize that the device came with a 110v plug. I read an earlier review who used a 220v (EU) plug converter, so I tried that. To my surprise it works great. I haven't had any trouble with it so far, and I've been using it everyday. It has become a lucrative part of my beauty and hair routine. For the price, you can't go wrong.